C: which is meant to only run windows and barely has any space on it left after XP was installed. D: which is where I store all my files. E: where I want my temporary files to be. How would you go about changing the location of the temp folder to E:/ in Windows XP? Aside from your small C: partition, you're describing a reasonably good set up. By moving your temporary files to E: you should not only get an improvement in available space on C:, but things might also speed up just a tad. First, I want to be clear to everyone that we're not talking about Internet Explorer's temporary files. Those are controlled by settings in Internet Explorer's options. Similarly, many applications also allow you to specify alternate locations for temporary files used by that application. We're talking about Windows itself. Windows has a concept of a directory where it, and other applications if they so choose, can place files that are for temporary use only. TMP and TEMP both specify the directory to be used for temporary files. Both TMP and TEMP are used for compatibility reasons. In this example they actually specify "C:\Documents and Settings\LeoN\Local Settings\Temp", but in 8.3 compatibility representation. You may see both TMP and TEMP listed in the section labeled User variables for (account). That's the common location; each different login account is assigned its own temporary location. Personally, I prefer to have a single location for the entire system. So if TMP and TEMP are present in the top list, I click on each and then click on Delete. However you can simply edit them, as we're about to edit the System copies, if you prefer. "... some programs can get confused if the temp directory is set to the root of a drive." In the Variable value: edit box you can now specify a path to a directory that Windows and many other programs should use for temporary files. As you can see, I've specified a different directory entirely, but still on the C: drive. You could specify "E:\" to use all of E: as your temporary location, but I'd actually recommend creating a subdirectory on E:, such as perhaps "E:\temp" and using that, as some programs can get confused if the temp directory is set to the root of a drive. Where did my edited attachment go? You get an email with an attachment, you edit the attachment and your work disappears. Why that happens, and how to work around it. How should I set up my computer? (Part II) - includes the changes I make to TMP and TEMP In my first article on setting up my new computer I walked through some of the basic actions I took to get my new machine configured. The saga continues! How do I know if I have more than one hard drive? If so, how do I find out if I have one or the other? Apeke: drives should be listed in Windows Explorer. "Manage", click on "Disk Management" and that should show you what you have. Is there anyway I can change my default location of my music and my pictures folder? Thanks for the info. Much appreciate it !! How to make wih this expression ? Nice little guide! It might also be beneficial for this person to put their swap file on E: if that's a fast drive. One thing I can't figure out though: How do you tell Windows XP where to put its Windows Update temporary files? It seems to just pick the drive with the most free space, which is not what I want it to do. Thank you - you saved me! I have Windows XP on a partition, and I tried copying a batch of files from an external drive to another partition, next thing you know Windows has spat its dummy because the C: drive is full (to the brim!). I was dreading the prospect of having to reboot from scratch, but now I've changed the location of the Windows temp folder - so big thanks! You may also consider deleting any *.TMP and TEMP folder files with professional software (something like History Killer Pro) on Windows start-up. How can I install Adobe reader to my E drive? 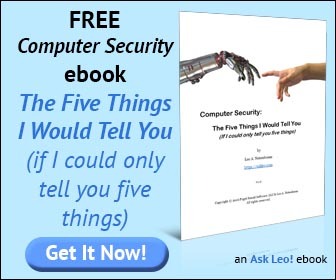 Dear Leo,Thanks so much for the help. I have a new problem: according to your instruction, I changed TEMP and TMP to E:?TEMP,but the Adobe is a;ways installed to C drive not E drive, very anoying. Please help me to install all temperary file to E drive because my C drive only has less then 15% mem left. Thank you. Now I can finally use 7-Zip as it uses a temp folder for file extraction, and I ran out of space on C.
I tried to do this in Windows 7 (change the variable value to D:\TEMP) but I don't see TEMP folder in the D drive. You have to create the folder first before it can be used. 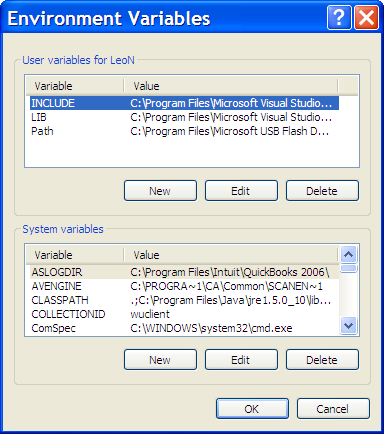 Setting the TMP variable only tells Windows what folder to use, it will not create that folder. Thanks Leo. I have another question. What happen if I also edit the TMP and TEMP under User Variable for ? Same thing. Those are user-specific settings, and apply to you when you're logged in. You can delete them and the system settings will take over, or you can set them to whatever you like. 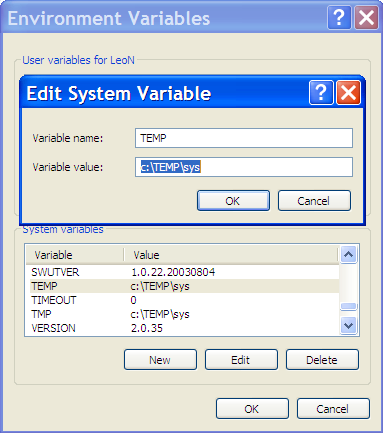 In Windows 7, under User variable for the value for TEMP and TMP is %USERPROFILE%\AppData\Lacal\Temp, and under System variables the value for TEMP and TMP is %SystemRoot%\TEMP. How do I change it to another drive? Thanks. Just set it to the explicit path, like "D:\MyTempFolder"
Usually I have 2 accounts (admin and user) in my WinXP and I use this method to keep temp files in one location. I.e. both account's temp folder and the system temp are same. Also this needs some security tip. Because all accounts (admin, user and any built-in ones ) and the system access same folder, I change the folder's permission as "Everyone | Full access". And my question: recently I moved to Win7 and found that I can use this method only for admin account. 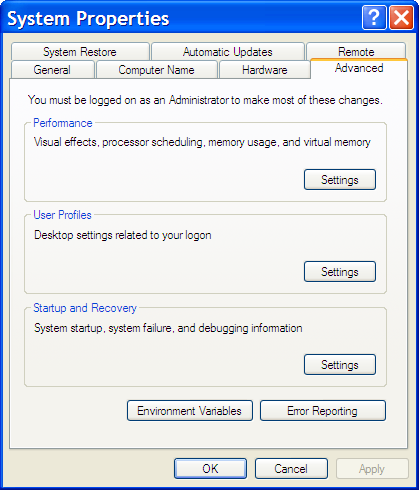 When I'm trying to access "Computer | Advanced system settings" (where Environment var-s located) from a standard user account, I have to switch to the admin acccount, so I get env var-s of the admin. In WinXP there was no problem. Any help? Thanks for the article. However, if I would like to have temp environment changed for all my users who logon to a Terminal Service, how do I do that. Is there a registry entry which I could change? I need to change it for all my users do to an application which does not like long paths for TEMP. Does this move the files, or just change the pointer for any new entries? I want to actually MOVE the filter in my current TMP and TEMP folders. I have used the above operations, and it works for any new entries. But, I am afraid that, if I move the current info to the new locations, it will screw up any previous file installations and/or registry entries. great post. Have been looking for how to do this forever as my main drive is a ssd to its not the biggest, now i can work with large files without getting errors. I've been having this issue the past two days since I did the same thing! I only gave xp about 9 gigs of space and now it's freaking out..can't download anything..i moved my internet temp folders but couldn't figure out how to move the windows temp files. Thanks so much! Very useful, except I cannot find the command prompt command, it's not where Windows says it should be (in the start/accessories section). Do you have an idea where it might be hiding pease ? Just click on Start, Run and then type in "cmd" as the command to run. That's the Windows Command Prompt. Great post, I'm running out of space and now I can free some - THX ! Using cmd/command prompt to change these variables is not effective. It will only change them for that cmd session. You must use the GUI if you want the changes to stick. I only have C and D partitions on my hard drive. Can I do the same to move the temp folder to D or do I need a third location? It's fine to have your Temp folder on the C or D or wherever space allows. The E drive was just a hypothetical example of where the Temp folder could be moved in case the C and D drives were too small to hold it. Wielkie dzieki from Poland, Leo! Is it okay if I use an External Drive for the temporary files, instead of the Internal one? You can, but it will likely slow down your system, potentially a lot, as external drives are often much slower than interal. My friend computer locked & all default users & admins are diabled how to hack the machine without formating xp Sp 3...? It is possible to reset the Windows passwords by downloading the Offline NT Password and Registry Editor, burning it to a CD. After changing the path for TEMP and TMP i rebooted the system, but no change in size filled of my SSD drive (Boot Drive), so i checked, they were not moved to the new location (obviously) and almost everything in the Temp folder (at the usual location) was gone. After trying a few times more i found out (here) that i need to create the folder first at the new location, i did so, and tried again. Again, no luck and i still can't figure out where my Temp files went and my main drive (SSD) was still 49GB/58GB (filled). I would like to thank you very much for the help that you done for me. I was in a bid trouble with that. So you solved that. Thank you very very much Leo.